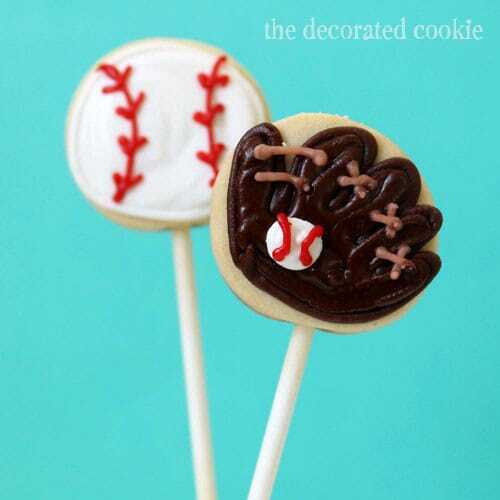 BASEBALL COOKIES-- How to decorate baseball and mitt cookies. 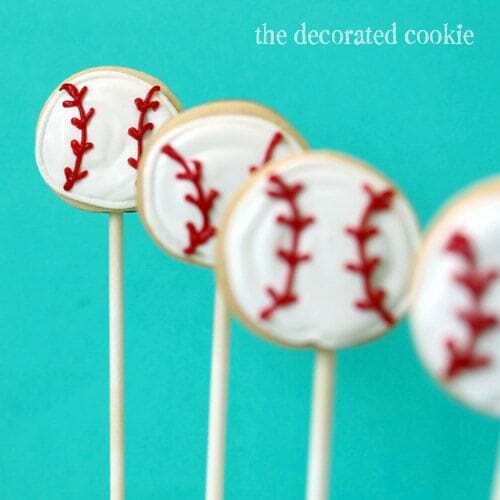 How to decorate baseball cookies on a stick. 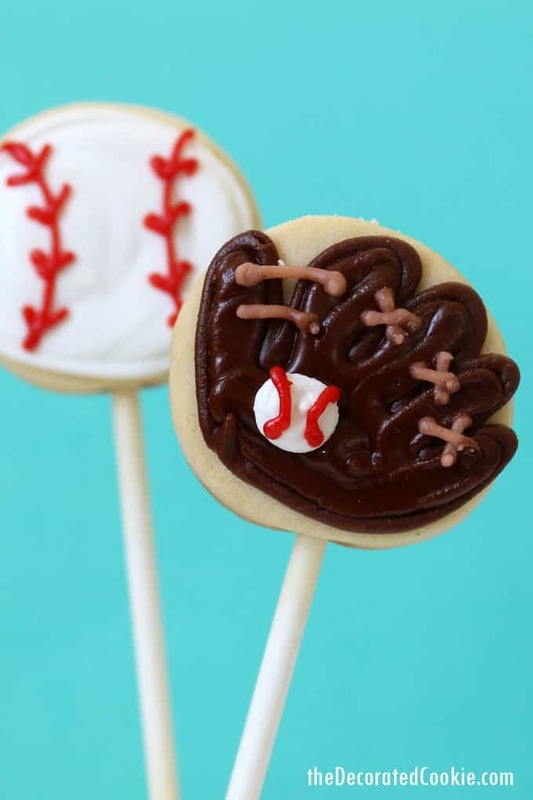 Don’t be fooled by these cute, bite-size baseball cookies. I’m not a sports person. 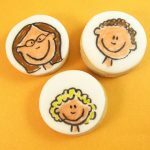 I made these for a friend’s son’s birthday party. He likes sports. He turned four. That all sounds about right. It’s a well-known fact that sports and I don’t mix. I played soccer a bit when I was a kid. Even field hockey. But I don’t do well with team sports. Tennis was my game. Singles only. I even played competitively in high school. But I just summed up my entire sports history. I don’t watch any sports on television (booooooring! ), I follow no teams, and I only watch sports in arenas if dragged by a significant other. I know that sports are a source of great exercise, entertainment and passion for many–probably most–of you, but not this gal. I once fell asleep at a football game. “Once” because I’ve only been to a couple football games. I promise to fall asleep again if I have to endure another waste-of-hours trek to a stadium. 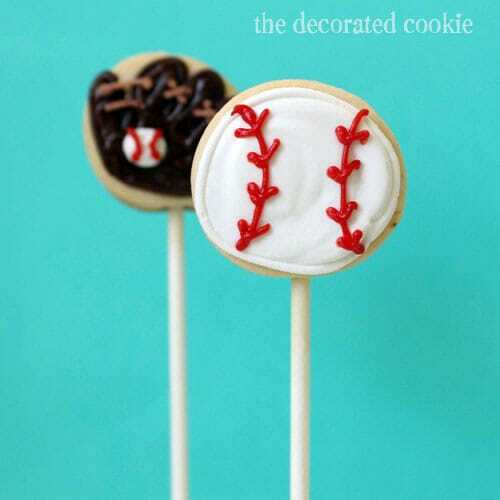 If you’re more into sports than I am, you might like these fun food ideas, too. I made my cookie dough and royal icing. 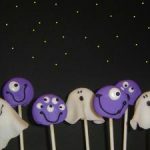 I cut out 1 1/2-inch circles and made cookie pops. I used Americolor Soft Gel Pastes (Bright White, Chocolate Brown, and Red Red) to tint the icing white, red and two shades of brown. I prepared disposable decorating bags with couplers and tips (sizes 2, 3 and 4), supplies found at the craft store. For basic cookie decorating how-tos, click HERE. Let the cookies dry overnight before handling or packaging. 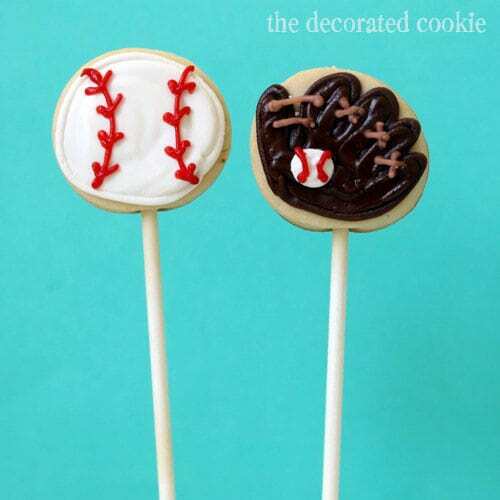 To make the baseballs, outline the cookies with white icing using a size “3” tip. Then pipe or flood to fill with white. Let the cookies dry a bit and use a size “2” decorating tip to pipe the stitching. To make the mitts, outline the mitts with brown icing using a size “3” tip. Let dry a bit and pipe with a size “4” tip or flood to fill with brown. Let dry a bit and use a size “2” tip to pipe the lacing. Pipe a white dot with red stripes. 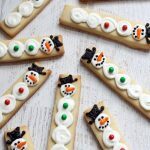 What a yummy and adorable way to get the season started! 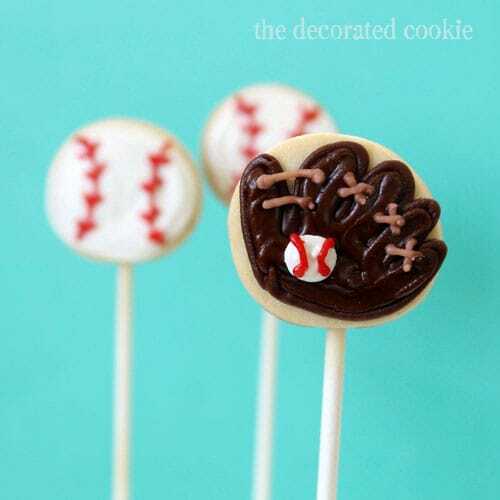 Baseball cookie pops are perfect for a little boy and yours are perfect! 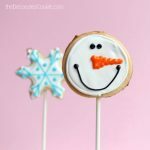 These are adorable cookie pops! I like the mitts the best. I agree I was not into playing sports either. 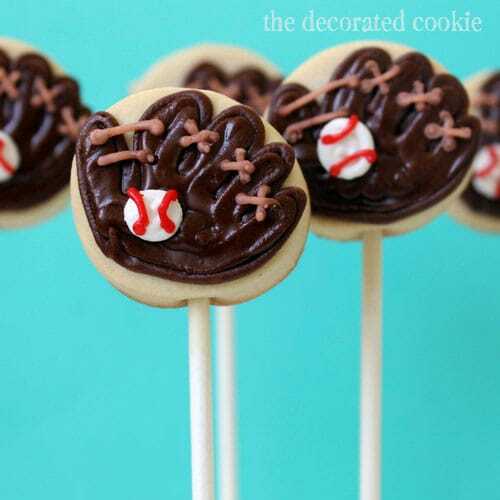 But eating sports themed cookie pops, now that’s something I could get into. I’m right with you, I don’t like to watch/play sports either! 😉 But those are cute!